A few posts ago, I mentioned that I was packing my Kaleidoscope House away. While I was in the middle of packing it , I decided to decorate it instead. Shrug. 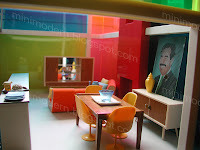 Above are images of the new living/dining room. Wow! It looks awesome, I'd love to live there. My favorite things are the sideboard and the orange tulip-y chairs... needless to say, I envy your collection and your decorating skills. Thanks for an amazing site. 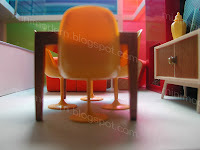 I have started a new blog on collecting modern miniatures at www.moderndollhouse.blogspot.com. I have set up a link to your site and am starting to list my favorite sites. I'm new to blogging so your site is very inspiring. 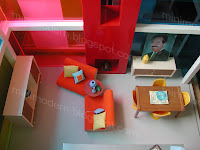 I am planning on building my own modern dollhouse so look for posts regarding that. Keep up the great work. Where did you get the sideboard, table, and bookcase from? They are so cool! The table is from the DHE. 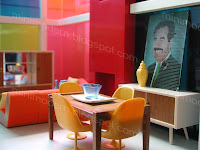 The bookcase and sideboard are from a vintage Kitty Puppenmobel set that I got from ebay. It was utterly filthy when I got it but after much much elbow grease, true beauty came through.